The government of Papua New Guinea says it has no plans to revoke the licence of Nautilus Minerals after it was announced the company will be delisted from the Toronto Stock Exchange. The embattled Canadian mining company was due to be removed from the TSX at the close of trading on Wednesday 3rd April (local time) after failing to meet the Exchange’s listing requirements. 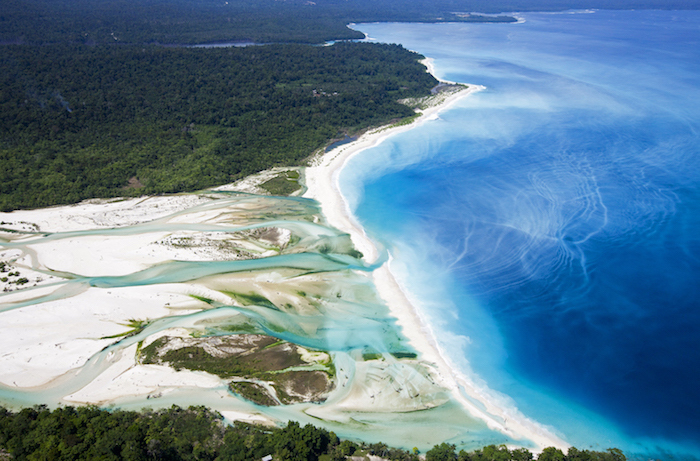 The delisting follows a sustained period of financial trouble for Nautilus, which had plans for what would have been the world’s first sea bed mining project, the Solwara 1 in PNG’s waters between the islands of New Ireland and New Britain. 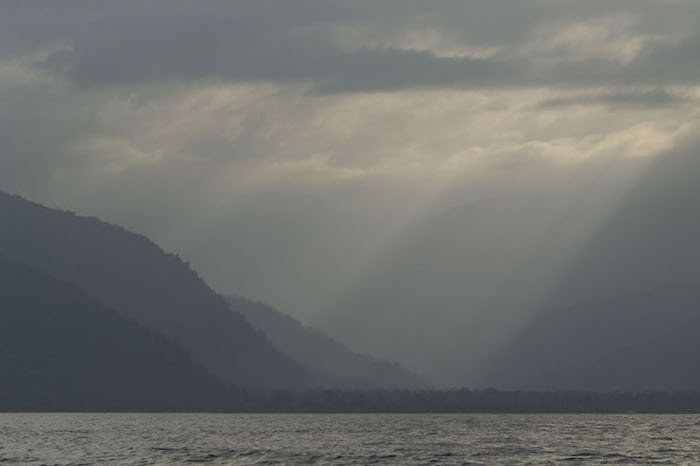 Papua New Guinea has a 15 per cent equity stake in the Solwara 1 project. PNG’s Minister for Mining, Johnson Tuke, said the government and the Mineral Resources Authority won’t be revoking Nautilus’ mining licence, as they haven’t breached its conditions. “The government has a certain percentage in the mine and the operation at New Ireland,” he told Pacific Beat. “But they’ve complied with the conditions of the licence. Mr Tuke said the government would potentially be seeking financial compensation at a later date, but they’re not currently exploring that option. Landowners and local and international anti-mining groups have been vocal in their opposition to the Solwara 1 project. Jonathan Mesulam from the Alliance of Solwara Warriors said the delisting showed that shareholders and investors didn’t have confidence in Nautilus. 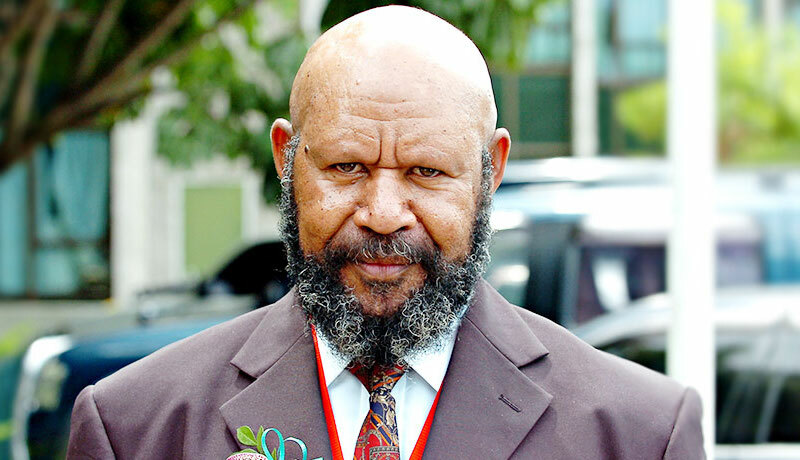 He urged PNG’s political leaders to sit up and take notice. “We are calling on … the national government to remove the licence from Nautilus Minerals and not to give any more licences to any other companies that are trying to come and do mining around the ocean, around the Bismarck, in PNG, and also the Pacific as well,” he told Pacific Beat. Nautilus Minerals told Pacific Beat they’re unable to comment due to its ongoing Sale and Investment Solicitation Plan (SISP). Politician’s love to make fancy promises – but do they ever actually deliver? 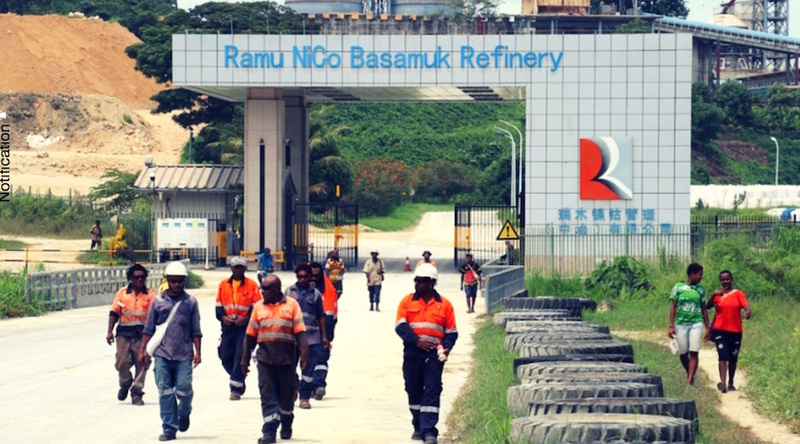 MINING Minister Johnson Tuke has said, before he signs any documents regarding the Ramu NiCo project, he needs to understand what is there for the landowners. “When I understand and am really convinced then I will sign the agreement for the expansion, otherwise that will not happen,” Mr Tuke said. He said he had discussed with Prime Minister Peter O’Neill the licence that government will issue for the expansion must be under a new agreement. Mr Tuke said many mining companies usually say they will only give according to the MoA, however, there must be some form of kindness and humility when dealing with the local landowners whose land and water were given away for the project. Madang Governor Peter Yama said the new expansion plan for the Ramu project will be properly discussed and he, as the head of the province, must be convinced that the people of Madang receive more benefits. He said the old agreement that was signed before the construction and the operation of the Ramu Nickel Project must be done away with. He said that the Prime Minister Peter O’Neill during his visit to Usino had publicly announced that the new agreement will be a fresh start. Mr Yama said he is in full support of a new agreement for the Ramu NiCo Project, and stressed that all the parties that will be signing the agreement including the National Government, the provincial government, and the developer Ramu NiCo (MCC) must make sure the agreement provides better benefits to the people of Madang. This is particularly for those from the impacted communities, the developer Ramu NiCo, Madang province, and the country. Politicians in Papua New Guinea have thrown their support behind a plan to power the country’s development through coal. The plan to establish coal mines and power plants gained prominence following a publicity tour hosted by rugby stars and sponsored by Australian mining and energy firm Mayur. Mayur’s proposal for a project combining coal, solar and biomass energy remains stalled, pending approval by the country’s newly restructured energy utility. 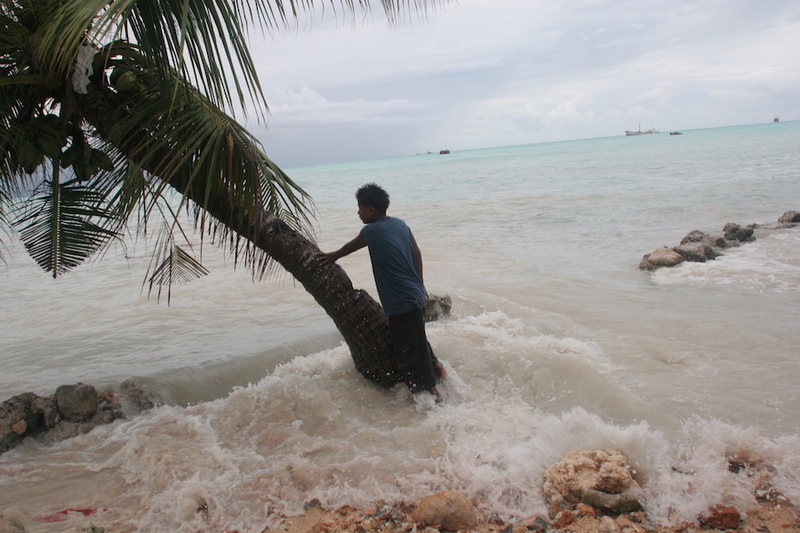 The project faces opposition both locally and in other Pacific island states, where climate change-driven sea level rises pose a serious threat. Politicians in Papua New Guinea are ratcheting up their support for a new foray into coal mining and power generation, even as neighboring states call for a global reduction in carbon emissions to stave off a catastrophic rise in the sea level. PNG’s mining minister, Johnson Tuke, recently hailed the prospect of a new coal industry to boost government revenue and public access to electricity, following visits to coal mines and power stations in Australia. PNG has no coal mines or coal-fired power plants; in Australia, 60 percent of grid electricity comes from burning coal. 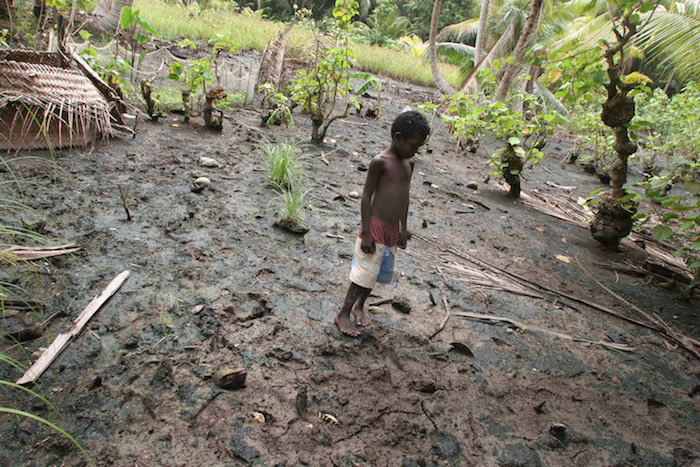 A young boy looks at the mud, contaminated by salt water, that used to be a garden on Iangain Island in Papua New Guinea. 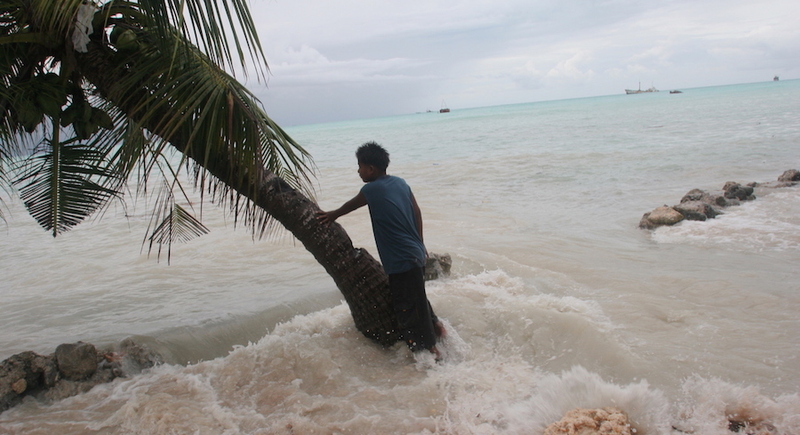 Pacific Island leaders have identified sea level rise as one of the primary threats facing the region. Image © Greenpeace / Jeremy Sutton-Hibbert. Australian extractive and energy company Mayur Resources has plans to construct a mixed coal power station in the eastern PNG port city of Lae, in the province of Morobe. Mayur, which has a major stake in coal exploration in neighboring Gulf province, signed a memorandum of agreement last October with the Lae city authority and the Morobe government to build an “Enviro Energy Park.” The project, which aims to use solar energy, coal and renewable biomass sourced within the country to generate electricity, has received environmental approval and is backed by Mining Minister Tuke, Energy Minister Sam Basil, and Lae MP John Rosso. Mayur says coal is needed to help provide cheap, reliable electricity, and will help boost living standards and economic growth. “We, as a 100 percent PNG industrial minerals and energy-focused business, are passionate about injecting all forms of energy that are cheaper and better environmentally than what PNG currently has, that also generates local industry and displaces imported energy fuels, such as heavy fuel oils and diesel, that drain PNG’s wealth,” Paul Mulder, Mayur Resources’ managing director, tells Mongabay. Although the country produces and exports natural gas, refined and crude petroleum accounted for 11.2 percent of PNG’s total imports in 2017, costing the country nearly $400 million. PNG has one of the world’s lowest electrification rates: only about 13 percent of its people have access to mains electricity. Rugged forest-covered mountain ranges and scattered islands make grid-based power distribution a logistical challenge. This lack of access to electricity, widespread in rural areas where more than 80 percent of the country’s 8.2 million people live, contributes to the country’s low human development; an estimated 40 percent of people live below the poverty line. Nevertheless, the PNG government is yet to issue any coal mining licenses and the proposed Enviro Energy Park remains in limbo without a power purchasing contract. Mayur was invited by state-owned PNG Power Ltd. to submit a proposal in 2015, but the proposal has yet to be assessed by the power company’s board. PNG Power underwent a major restructuring in 2018, and with the new management came new priorities. In February, PNG Power’s acting managing director, Carolyn Blacklock, told the Post Courier newspaper that the utility now plans to increase the use of renewable energy without coal, and that a competitive, public bidding process will be required before any new projects are commissioned. “It is not a planned activity of PNG Power and is not being considered,’ Blacklock said of Mayur’s 2015 proposal. There could be changes in the country’s power industry with a new National Energy Bill currently being finalized. If passed, this would mandate a National Energy Authority to enforce safety and quality standards in the industry, encourage more power companies to operate, and increase competitive electricity pricing. But there is still opposition from civil society, even after Mayur arranged for Australian rugby legends Sam Thaiday and Darren Lockyer (who is employed as the company’s business affairs manager), to visit PNG earlier this year and talk up the coal industry. Local environmental group Nogat Coal PNG and landowners in Morobe province’s Markham Valley, the site of a potential biomass energy project, say coal has no place in the country. The Australian-backed case for coal faces wider opposition. Many leaders across the Pacific view the developed nation’s refusal to transition away from coal and reduce its carbon emissions — which reached a record high of nearly 530 million tonnes in March last year — as contributing to their potential demise due to climate change. MINING Minister Johnson Tuke is impressed with coal-powered technology used in Australia and has indicated strong backing of the Lae coal-powered plant project. Mr Tuke’s trip to one of Australia’s coal mines in January assured him that the similar technology that will be used by Mayur Resources for the K400 million proposed project for Lae will be beneficial. He said globally, coal is a resource of immense proportions and PNG has never mined coal, while neighbouring countries, especially Australia and Indonesia, continue to reap the rewards of this commodity by exporting and empowering their people with far higher living standards than what we have in PNG, while using inferior coal quality compared with our PNG coal. “This coal has remained in the ground and until recent years this was the same story for gas, which now is a thriving LNG sector,” Mr Tuke said. “If you look at Australia, they are benefiting by creating large revenue from coal exports and domestically, coal still provides more than 60 per cent of all their electricity generation. Coal is forecast to be Australia’s largest export earner at AUD$58.1 billion (K137.5bn) in 2018-19, this one commodity is two times PNG’s GDP for the entire country per year. “That’s K138 billion and while we may not have this volume to export or use internally, even imagine if a coal industry could add K1-2 billion to government revenue. Gulf Province is endowed with extensive far cleaner coal seams than what Australia uses and you can even touch it at the surface. He said Vales Point (NSW, Australia) operating coal power plant produces 1330 megawatts, 2 two times bigger than PNG’s total installed electricity and that is 26 times bigger than what is proposed in Lae. Mayur Resources managing director Paul Mulder said the proposed coal powered plant in Lae is similar and will rid Lae city of its blackout situation once given permission to supply power on the Ramu Grid. He said power supply will be on 24 hours — 7 days a week, 100 per cent continuous supply for Lae city. Mr Tuke said that people should not be blind to what is happening outside PNG in neighbouring countries. Mining Minister Johnson Tuke has urged all exploration and mining firms to conduct due diligence when it comes to affected landowners in project sites. 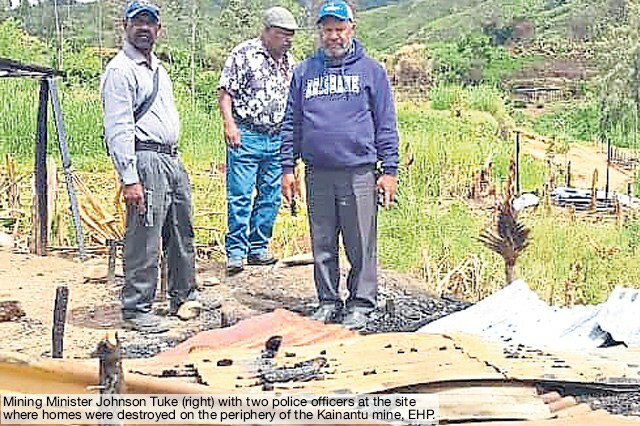 Tuke issued the warning following an incident at the Kainantu gold mine, Eastern Highlands, where one person was reported killed, 70 houses destroyed and 50 people injured following a conflict last week. He told The National yesterday: “This is exactly what happens when certain exploration companies do not conduct due diligence when it comes to considering landowners. “I am telling all companies to behave diligently, to accommodate landowners, communities. “Companies should be the ones to conduct social mapping. “This issue (Kainantu gold mine) was provoked by the K92 (K92 Mining Inc). “There was one death, 60 to 70 houses burnt because of the involvement of the company to engage one faction of the landowners. “The other faction put up an argument and eventually they ended up fighting. “A similar case was earlier reported in Southern Highlands when an exploration company failed to address that. “Now it has happened again in Kainantu. K92 Mining Inc is focused on advancing the Kainantu gold mine. The Kainantu property covers a total area of approximately 410sqkm and was previously mined by Highlands Pacific and Barrick Gold from 2006-2009. After being commissioned in 2006, the processing facilities operated for a cumulative total of approximately 7000 hours (292 days) before being put on care and maintenance by Barrick Gold. Barrick continued this care and maintenance of the mill until the sale of the project to K92. THE US$5 billion (K16.7 billion) Wafi-Golpu gold and copper project in Morobe Province has been shut down. This shutdown took effect last Friday when about 100 men claiming to be landowners threatened to enter the exploration and development site following opposition to the memorandum of understanding which was signed between the State and the developer Wafi-Golpu Joint Venture in Port Moresby last December. Activities at the exploration site are currently suspended pending assurance that law and order has been re-established. A disappointed mining Minister Johnson Tuke said this shutdown is uncalled for and the actions taken by these parties to raise their grievances is a sense of a criminal act. He explained that the state has gone into an engagement with the company to develop an understanding with the state and the developer. Reports on the ground say all staff were evacuated to safety leaving the project site deserted since Friday after protestors threatened to enter the exploration camp unless it was evacuated and work immediately stopped. Mr Tuke said that in most cases as far as history is concerned in any mining aspects before a initial mine starts there had to be form of an agreement to give comfort and in most cases and instances companies did not have the money. He said there were certain institutions which had access to huge chunks of money so companies go out to the fields to conduct explorations to identify and come up with the resource and when they find the resource they have to run through a financial institution to look for money and financial institutions have their own criteria as to go about releasing the money to investors. “So the government in its wisdom has given the consent to the company that this project is a priority to the company so that’s the relationship that we have established. “And for people to go and conduct a shutdown is uncalled for, the understanding is with the State. “It’s not the provincial government or the landowners or anybody else, the common law is that anything that is six feet beneath the earth belongs to the State, the State has all the legitimate power to act on its people,” Mr Tuke said. He said what they have done is within the law, within the Act so for people to go out and stop the mine is unnecessary. “It is a sense of criminal act there has to be an appropriate authority to do so the government will still provide leadership and bring this project into fruition and that is not the appropriate forum to talk about all these,” he said. “I have already instituted a development forum that is still in progress. We can see that challenge but a challenge has to be taken in a appropriate action and this is outside of the context and I condemn those actions undertaken by some elements. Mr Tuke said said for them to take it to a broad degree or a standing where it now becomes a common knowledge to PNG is not good enough and Wafi-Golpu is a very relevant project because in the next 10 to 20 years Porgera and Ok Tedi might shutdown. “We are still a mining country and we need to take on board this Wafi-Golpu project so that it in the years to come that will be in the place that the two mines will go down so that it can generate revenue to our country and that’s basically what we are trying to do,” he said. They made known their grievances but I think it’s not appropriate for them to go that far because they are certain forms which we have not exhausted them all yet and we just started the process and we are still into it and we have a long way to go and we will still go through that,” he said. Mining Minister Johnson Tuke visited a coal fired power plant north of Sydney to gain a perspective on modern technology and the benefits of utilizing PNG’s own domestic coal resources. The 15th Papua New Guinea Mining and Petroleum Investment Conference was held in Sydney, Australia last month, with an extensive focus placed on the future of mining and energy solutions for Papua New Guinea. 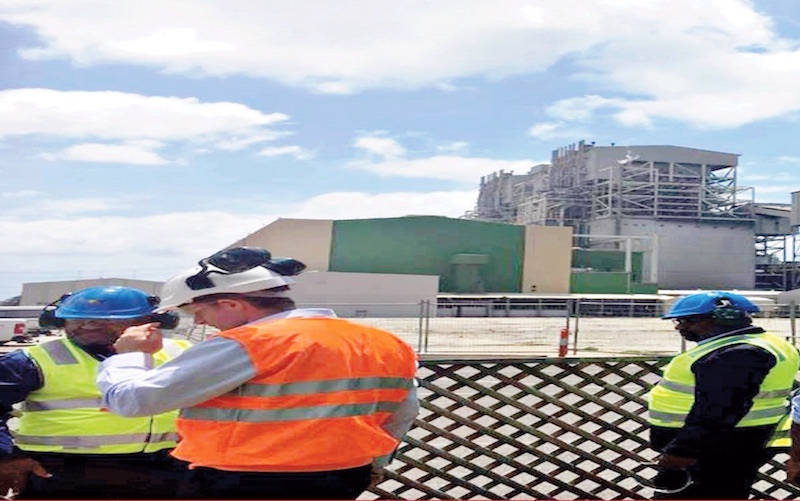 While attending the Conference last month, a senior PNG government delegation led by the minister conducted a visit to one of Australia’s longest running power plants. The Mining Minister’s focus was to understand better how PNG could benefit from a more diversified energy mix at the lowest cost while also developing a more diversified resources and mining sector. PNG, while strong in gold, copper, and recently in natural gas and nickel production needs to diversify its opportunities and create new revenue sectors for the nation. This was a sentiment echoed throughout the Sydney conference. Power generation was also key topic of debate at the conference, including the nationwide electrification program that is essential for PNG to meet its commitments set out in the Alotau accords. “While it is a debated topic currently, especially in the Lae region, NEC has agreed that in our current state of energy poverty with only 13 per cent of our people having access to electricity, we will look at all forms of energy in our energy mix as all other nations around us have and will continue to do. He reminded those critical to idea of a coal producing PNG, not to forget that for the last 43 years since independence most of PNG’s electricity has come from high polluting imported heavy fuel oil and diesel. “I need to remind them we have our own cleaner low cost, low ash, low Sulphur high quality coal right here in PNG in the Gulf Province. “Globally coal is a resource of immense proportions. PNG has never mined Coal, while our neighbouring countries (especially Australia and Indonesia) continue to reap the rewards of this commodity by exporting and empowering their people with far higher living standards than what we have in PNG while using inferior coal quality compared with our PNG coal,” Mr Tuke said.